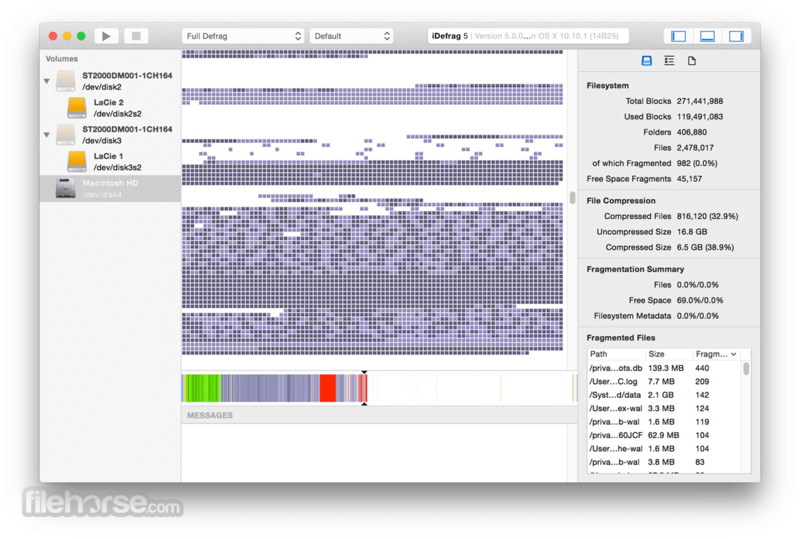 iDefrag for Mac is advanced Mac OS X disk defragmentation and optimization tool. Supports the very latest features of HFS+, including journaling, case sensitive filenames and adaptive hot file clustering (which means it won't mess-up the Hot Zone). iDefrag for Mac helps defragment and optimize your disk for improved performance. If you use spinning disks, you’ll have noticed that over time it takes longer and longer to access your files, to start your applications and even to start your machine. This is an unavoidable consequence of the way hard disks work. It can be made better or worse by the design of the filesystem (and, actually, in this respect your Mac’s filesystem, HFS+, is one of the best), but in the long run there’s really no way to avoid this effect. The cause of this slow-down is fragmentation, and when it happens, you need iDefrag. We’ve made iDefrag fit in with the latest version of Mac OS X. The old statistics tab was dense and hard to understand. We’ve simplified and refined the information, and put it in the sidebar. You can now select multiple files and tell iDefrag to defragment them all at once. We’ve improved the way iDefrag deals with bad blocks; it will now tell you which file is affected and carry on with the rest of the disk. We’ve rewritten the documentation to make it easier to read. It’s a disk optimizer. That means it doesn’t just defragment individual files — it actually rearranges the files on your disk so that your system runs faster. iDefrag 5 works on Yosemite or later. Older systems need iDefrag 2 instead. If you buy iDefrag 5, you will have access to older versions as required. No CD/DVD or external disk required! In most cases you will not need a bootable CD, DVD or another disk to use iDefrag. iDefrag supports journaled and case-sensitive HFS+, and knows about features like the Hot Zone. iDefrag can perform simple defragmentation while the disk is still in use. Good for situations where you don’t need the full power of the optimizer, but have a few fragmented files you want to sort out. See the individual blocks used by your files, watch iDefrag move them around in real time, and get an at-a-glance overview of the state of your disk.